On the campaign trail in the lead up to the 2018 Ontario election, the right-wing conservative Doug Ford raised problems with the provincial health care system and promised his constituents that “help is on the way.” Now that Ford is Ontario’s conservative Premier, he is not helping the health care system, but putting it–and this vital public service–on the chopping block. Ford is placing our health and the health of our families in the hands of those whose primary concern is to profit, not to meet our needs. How do we stop this? How can we organize to collectively improve rather than privatize and destroy this public good? The last time anything threatening as this happened in Ontario, the labour movement responded with the Days of Action. What can we learn and creatively adapt from that experience? 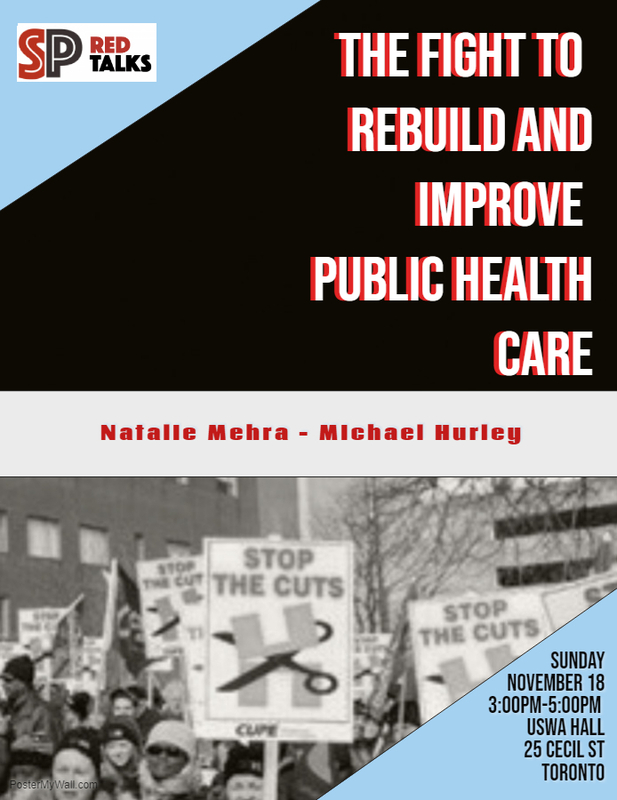 Join Natalie Mehra and Michael Hurley for a discussion about Ford’s threat to the public health care system in Ontario, and what we need to do to secure, rebuild and improve public health care for all. Michael Hurley is the President of the Ontario Council of Hospital Unions and was the first Vice-President of CUPE Ontario.